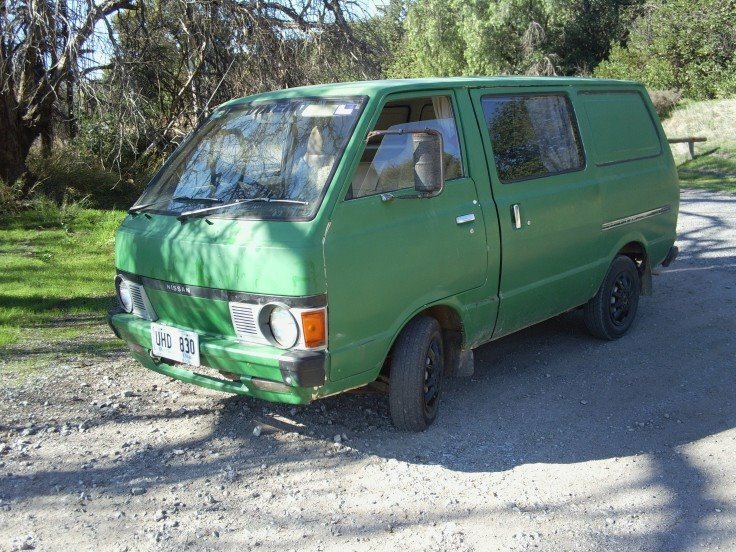 Asking people to donate money to get my Frog Van fixed may not sit quite right with some people. It's not like I'm a charity, right? No doubt plenty of you work hard to keep your own cars on the road with your own money too, so why should you give money to me? So here's the thing. I'm not asking you to just give me your money so I can get my car fixed. I'm saying, if you've enjoyed reading my blogs, found a tutorial or advice column in them useful to your own life, been entertained by my writing, art or animations or found one of my tutorial videos very informative then, by donating to my Frog Van fund, you have the opportunity to do something that would really be useful to me, more than just a nice comment or message saying thank you can. Not only that but, once I get my van back on the road, it'll give me more opportunity to write about and share my experiences with you in this blog because I will be able to travel much further away from my home more frequently. Like I was able to when the Frog Van was on the road. As a self employed artist/designer and all round creative person I don't actually make enough money to support myself i.e. keep a roof over my head and buy food. I have a very supportive partner who does that, to which I'm extremely thankful for. When I do earn money I try to spend some of it on taking us both out as a way of saying thank you. I earn enough to pay my business expenses and other smaller personal expenses. What I earn I have to make last because it can be months between jobs. It's rare that I can afford to spend large amounts, like the $500.00 target I'm hoping to reach to fix my van, in one lump sum. Though if I get a good run of freelance work, this time I will definitely be throwing large chunks of what I earn at getting the van fixed instead of paying registration fees. With what I paid in the last six months in registration fees (close to $400.00) I could have gotten the van fixed. Each of the last two times I registered the van, thinking I'd fixed it, I took it for one test drive and discovered it wasn't. Two of the most expensive test drives I've ever taken. I can't really afford to register it again without knowing it's fixed properly. So any donation you can make so I can afford a proper mechanic would be very much appreciated. Visit the Frog Van's GoFundMe page at http://www.gofundme.com/frogvan to make a donation either with your credit card or from your PayPal account. 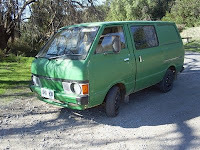 Once the van is back up and running again I'd love to perhaps find someone to sponsor it. Maybe a local travel agency or something. Nothing big. Just enough money to pay the registration and some for petrol in exchange for me blogging about places to see and experience in this part of the world. I've done plenty of travel writing in my blog and have even published a book of my 2007 road trip to Western Australia - in which I blogged my experiences every single day. I think that would be an ideal arrangement. 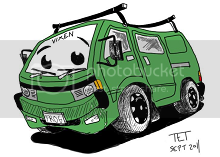 NB: If you really prefer to get something for your money then you could also help by purchasing one of my Frog Van Prints from my CafePress Store featuring the design on the right.